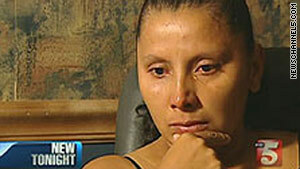 Juana Villegas was awarded $200,000 in a lawsuit against Tennessee. (CNN) -- An illegal immigrant who this week was awarded $200,000 in a lawsuit against a Tennessee sheriff's office will ask a federal judge to grant her permission to remain in the United States legally, her attorney told CNN. Now, her attorney, Elliott Ozment, says that he will ask the judge who oversaw the case to grant his client a U-visa, a special status that can be conferred on victims of crimes who are in the country illegally. The U-visa would allow Villegas -- a Mexican national -- to live and work legally in the country for three years, and can be renewed for another three years, Ozment said. During that period, she can adjust her status and become a legal citizen. It's a long shot, as a U-visa has been awarded by a federal judge only one time before. Usually, they are conferred by other immigration authorities. "We think the level of misconduct has risen to such a high level that she deserves a U-visa for what she suffered," Ozment said. "She has been the victim of a terrible, terrible wrong." Consideration of Villegas' fate comes as the Department of Homeland Security announces its intention to individually review roughly 300,000 pending deportation cases in federal immigration courts. Lower-priority cases -- those not involving individuals considered violent or otherwise dangerous -- will be suspended. Villegas' story begins on July 3, 2008, when she was nine months pregnant and driving home with her three children from a doctor's appointment in metro Nashville. A police officer pulled her over and, according to Villegas' complaint, decided to arrest her for driving without a license because the officer suspected she was in the country illegally. The decision to arrest her was influenced by a controversial agreement between the police department and the federal government that allowed local officers to help enforce immigration laws, known as section 287(g) of the Immigration and Nationality Act. She was transported to a detention center, where two days later, she went into labor. According to court documents, Villegas was taken to Nashville General Hospital where she was placed on a gurney with her hands and feet shackled. Once in her hospital room, two Davidson County sheriff's deputies refused to leave the room while she changed into her hospital gown, and unplugged her phone so she couldn't alert her husband about her labor, court documents say. Afterwards, one of the deputies shackled her left foot and right hand to the hospital bed, something that the medical staff called a "barbaric" violation of medical standards, court records state. The shackles were finally removed before she delivered the baby. "During the trial she testified about how she was afraid for the safety of her baby," her attorney, Ozment said. "She didn't know what to expect. She didn't know what was going to happen." After she had delivered the baby, and against doctor's orders, a third deputy shackled her to the bed again, according to the court documents. The sheriff's department's policies that led the deputies to shackle her throughout the ordeal were a violation of the U.S. and Tennessee constitutions, her lawyers argued. In April, U.S. District Judge William Haynes ruled in favor of Villegas, and after a three-day trial this week, the jury set the $200,000 award. Villegas' lawyers had asked for $1.2 million. Villegas also sued the U.S. government, alleging that she was wrongly arrested under the program. That lawsuit was dismissed. Villegas had once been deported from San Diego and returned illegally into the United States, and had lived here for years, her lawyer said. At the time of her arrest, her eldest son was 14, and he had been born in the United States.